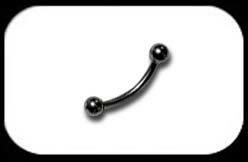 Black Steel Micro Curved Barbell 1.2mm with 3mm Balls. Available in 6,8 or 10mm length. 316L surgical steel with tough black PVD coating.